This is a delightful earthenware cup from Carlton Ware in their 'Walking Ware' series. 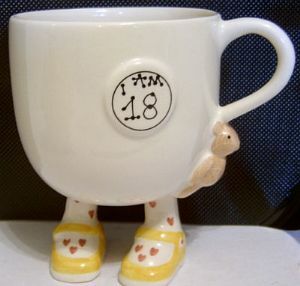 This one is a Birthday Cup - 'I Am 18'. Designed by Roger Michell (Lustre Pottery) for Carlton Ware , this particular cup is part of a small series with different years shown on the raised plate at the front. It has bright yellow shoes with red spotted socks, the spots being in the shape of hearts. At the base of the handle is a small brown teddy bear. There is no evidence of crazing. There are no chips/nibbles nor restoration work. The underside of one foot is backstamped with also Lustre Pottery 1978. The overall height of the Cup is 4.5 inches (11 cms). I can provide further photos if required but please include an email address in order for me to send the attachments.